The Sundarbans, the largest contiguous mangrove forest in the world, covers 6,017 km2 of the coastal zone of Bangladesh. Heritiera fomes Buch.-Ham., Excoecaria agallocha L. and Ceriops decandra (Griff.) Ding Hou jointly cover 95% of the forest area. 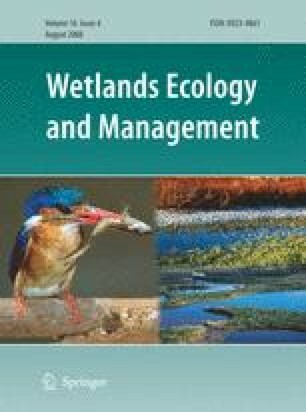 In this study, the results of four forest inventories have been analyzed to understand observed vegetation dynamics of the Sundarbans from 1926 to 1997. The diversity of forest types has been gradually reduced over time, but H. fomes and E. agallocha have maintained their dominance over large portions of the forest. H. fomes is spread over 67% of the vegetated area of the forest, concentrated mostly in the northeastern area, and constitutes 75% of the density of trees with >15 cm dbh. The distribution and stem density of H. fomes show negative relationships with that of E. agallocha and C. decandra. In terms of coverage, E. agallocha is the most common species, spread over 74% of the vegetated area of the forest, and constitutes 39% of the density of trees with >2.5 cm dbh. On a longer timeframe (1926–1997), the dominance (coverage and density of larger diameter trees) of H. fomes as well as that of E. agallocha is declining. Even on parameters such as density of trees with >15 cm dbh, the dominance of E. agallocha is declining at a much greater rate than H. fomes. This observation contradicts the successional schemes proposed by different authors. This might indicate that theorizing successional schemes based on short-term observations on vegetation dynamics is not sufficient. The effect of human interference, changes in hydroedaphic condition and species interaction should be taken into consideration during explaining observed vegetation dynamics. Moreover, the need to understand vegetation trajectories at the micro-scale should be emphasized. The authors are grateful to the Associate Editor and the anonymous reviewers for their constructive criticisms and comments.